We Analyzed 10 Years of Chiefmartec.com Content: What’s Trending in MarTech? In this data story, we dive into ChiefMarTec.com — one of the world’s most active blogs covering the marketing technology ecosystem. We crawled the entire archive from 2008 to 2018, and used Frase’s NLP engine to extract topics, and other useful metadata from them. The average word count has almost doubled since 2008. Higher word count aligns with SEO ranking factors studies showing that Google prefers long-form content. It’s interesting to see how certain topics completely fade away over the years. Topics like “semantic marketing” were very prominent in 2008 but are not mentioned at all after 2011. While terms such as “marketing stack” emerged in 2016 as new topics. In 2008, Chiefmartec.com discussed topics that seem basic today, like those related to the semantic web, and the foundations of website analytics. Toward the end of this era the term “marketing automation” started to take hold in the marketing industry. The term “MarTech” was introduced in 2012, and “agile marketing” quickly gained traction. Chiefmartec.com introduced the term “modern marketing” when new tools first embraced big data and real-time analytics. During this period, everything related to marketing automation was included as part of “digital marketing”. This era puts emphasis on the “marketing stack” which refers to a group of technology-based tools marketers use to execute marketing activities across different channels. The growth of the marketing stack created a bigger need for “marketing operations”. There was a lot of market consolidation during this time and many references to the “MarTech ecosystem”. We also see the introduction and increased use of the technology terms artificial intelligence, customer data, and blockchain. Gartner reporting about MarTech dramatically increased starting in 2012 which was the same time Oracle acquired Eloqua for $810 million. This was also the time when Yahoo unsurprisingly lost it’s MarTech prominence in 2011. In 2008, everything was about understanding internet marketing – how do search engines work? How do I track website visitors? Why is content marketing important? In 2018, we’ve transitioned to an environment where we put focus on the customer with topics like “customer experience” and “customer data platforms”. Based on Chiefmartec.com’s data, it appears as though we are experiencing a time of market consolidation, along with the emergence of disruptive technologies, namely artificial intelligence and blockchain. With so many MarTech vendors, managing the “marketing stack” now requires specific resources and strategy. This post is an on-going effort to collect the most reputable SEO Ranking Factors studies publicly available. Long-form content gets an average of 77.2% more links than short articles. The vast majority of online content gets few social shares and backlinks. In fact, 94% of all blog posts have zero external links. A small percentage of “Power Posts” get a disproportionate amount of social shares. Specifically, 1.3% of articles generate 75% of all social shares. Question headlines (titles that end with a “?”) get 23.3% more social shares than headlines that don’t end with a question mark. Certain content formats appear to work best for acquiring backlinks. We found that “Why Posts”, “What Posts” and infographics received 25.8% more links compared to videos and “How-to” posts. “Do links still matter for SEO in 2019?” – Stone Temple has been publishing this yearly report for a few years. All of their studies leverage Moz’s Link Explorer. The 2019 edition goes deep into analyzing the influence of links by sector (medical, financial, etc.) and query type (informational, transactional, etc.). This study analyzed 3.8 million data points across 100,000 YouTtube videos and 75,000 channels. This study by SEMRush and Ghergich & Co. analyzed 6.9 million featured snippets. This is the largest study of the impact of website speed on Google search rankings ever performed. Ahrefs contributed search ranking data. Load performance was measured using 5 metrics: (1) start render, (2) visually complete, (3) document complete, (4) fully loaded, and (5) number of file requests. The chart below indicates that overall page load time is especially faster for the first five positions. Rank 6 was, on average, 20% slower than rank 1. This study was performed with the goal of understanding Google’s Hummingbird update in 2016. Neil Patel partnered with Marketmuse to analyze a database of more than 31.5 million content items, organized in semantic topic clusters. The main conclusion was that Hummingbird ranks web pages that have comprehensive and thorough content on a narrow topic higher in the SERPs. In other words, if a website has a lot of really good, deep content, it’s going to rank well in the search results. Backlinks remain an extremely important Google ranking factor. We found the number of domains linking to a page correlated with rankings more than any other factor. We discovered that content rated as “topically relevant” (via MarketMuse), significantly outperformed content that didn’t cover a topic in-depth. Therefore, publishing focused content that covers a single topic may help with rankings. It is interesting to analyze how certain trends emerge – or fade out – over the years. For example, Backlinko’s massive study back in 2016 showed early evidence about the importance of “topically relevant” content. That same year, Neil Patel highlighted the importance of page load speed on a different study. The debate around the importance of backlinks is present across studies. Are SEO studies even a good thing for the industry? What’s your take? In this data story, we dive into the HubSpot Blog — one of the world’s most active marketing blogs. Our goal is to get a high-level understanding of HubSpot’s content strategy by analyzing their topics, links, and content structure at large scale. To this end, we crawled 13,124 URLs and used Frase’s NLP engine to extract topics automatically and other useful metadata from them. Blog posts published between 2013 and 2019. Approximately 80% of the content in this dataset is from 2016 to 2018; this study focuses on this period in order to keep results more accurate. The average word count has more than doubled since 2016. Higher word count aligns with SEO ranking factors studies showing that Google prefers long-form content. Along with content length, the number of images has also increased significantly since 2016. Studies have also shown Google’s preference for content that includes images. As shown in the chart below, more than half of HubSpot’s content is either a list or a how-to article which aligns with studies that show these content types to deliver best click-through-rate performance. This section analyzes hyperlinks used in the full text. The number of hyperlinks used per post has almost doubled since 2016. The majority of links are external (they point to domains outside hubspot.com), but the share of internal links increased significantly in 2018. Over half of HubSpot’s internal links point to the blog, followed by landing pages hosted at the root hubspot.com level. The chart below shows the most common domains HubSpot’s posts are linked to. Domains appear to be a combination of highly reputable technology publishers (Techcrunch, Wired), business publishers (HBR, Forbes), research-oriented sites (Wikipedia, Statista, Investopedia), and internet marketing blogs (Moz, Search Engine Land). The chart below breaks down HubSpot’s hyperlinks pointing to social media and content-sharing platforms. For every blog post, Frase analyzed both titles and full text to extract topics. Topic extraction was performed using Frase’s Named Entity Recognition engine, which can detect topics and classify them by concept, organization, person, and location. The chart below shows the most prominent topics mentioned across titles (2016-2018 period). The table below shows the top 10 title topics by year. This table excludes company names (such as “Facebook” or “Google”), and focuses on conceptual topics (such as “social media” or “landing page”). The chart below shows the most mentioned organizations in the full text. Excluded from this chart are Facebook, Google, Twitter, and Linkedin. The chart below shows people (first name and last name) detected in the full text. One of the goals of this study was to identify topic trends. HubSpot heavily used specific topics in the past that are less prominent, or inexistent in the present. The chart below shows some clear examples of topics that were popular in 2017, but much less used in 2018. In the case of “inbound marketing,” the topic was mentioned in 150 titles in 2017, but it didn’t make it to a single title in 2018. In contrast, the chart below shows topics that were not prominent in 2017 that picked up visibility in 2018. For example “customer success” never appeared in titles in 2017, but became a relevant topic in 2018. After analyzing the full dataset (with blog posts dating back to 2013), we identified specific topics in 2018 that had never appeared in titles before. Hubspot is not only publishing dozens of blog posts per week, but they are creating long-form content. HubSpot is betting on educational content in the form of guides, how-to and lists. HubSpot has created a wide net of topics which maximizes their chance of ranking for many search queries. HubSpot is keeping their content up-to-date with news-driven topics and trends. With the launch of their News & Trends category in 2018, HubSpot is not only an inbound marketing blog, but it is closer to becoming a publisher. No doubt, if you want to rank in Google in 2019, you need to create high-quality content. Unfortunately, you can still create incredible content and never rank on page 1! This is a situation many of our customers at Frase are facing. We’ve provided tools to help you craft great content, but is it actually driving organic traffic? The reality is that half of your SEO success relies on choosing search queries you can realistically rank for. Given the amount of content published every single day, keyword research might be more important than ever. By “keyword research” I refer to the process of deciding what specific search queries we aim to rank for. Once keyword research is sorted, we can focus on creating and optimizing content. So, how do we decide what search queries are worth pursuing? In my constant quest to understanding keyword research, I put together a list of strategies I’ve either leveraged myself, or seen others successfully implement. As defined by Wordstream, long-tail keywords are “longer and more specific keyword phrases that visitors are more likely to use when they’re closer to a point-of-purchase or when they’re using voice search.” These keywords might not carry massive traffic, but they are way more targeted. In contrast, short keywords usually carry high traffic volume, but fierce competition. For example, “SEO” is an extremely competitive query that gets nearly 1 million monthly searches, and is filled with ads. I am not even gonna try to rank there. Pro tip: use Keyword Everywhere’s Chrome Extension to get quick stats as you search in Google. So I am gonna try to find more focused, long-tail keywords where I can compete and win. In my case, I am interested in queries such as “how to optimize content for SEO”. As you can see below, Keywords Everywhere quickly shows how this long-tail query has way less competition. Ideas from forums: analyze what users are asking in forums and communities. This can help you come up with real-life questions your audience might have. Places like Quora or Reddit are great sources of inspiration for long-tail queries. Questions also have a higher chance of capturing a Featured Snippet in Google. Frase provides a tool to help you find questions across forums. Keyword research tools: in addition to Keywords Everywhere, I personally use Google Keyword Planner (free) and Kwfinder (starts at $25/mo). I like Google Keyword Planner to identify many keyword variations, while I use Kwfinder to analyze backlinks and domain authority across top results for my keywords of interest. Ultimately, my goal is to find long-tail keywords that have low competition and decent traffic (at least 50-100 searches per month). If you want to dig deeper into “keyword difficulty”, these are 2 good resources: The Big, Vital, All-in-One Guide to Keyword Difficulty and What is the Keyword SEO Difficulty? Queries with high CPC (cost per click) usually represent keywords that are driving business to somebody. In other words, companies are betting high on those keywords because they are converting into customers. If you dig deep into high CPC queries, you might be able to find queries with both high CPC and low SEO difficulty. This means you can potentially rank for queries other companies are paying a premium in ads. To accomplish this, I would again use a combination of Google Keyword Planner (to make a list of high CPC keywords) and Kwfinder (to identify low difficulty keywords based on backlinks and domain authority). You want to know what queries your competitors are ranking for, both organically and through PPC. Ahrefs is one of the most accurate tools to give you this information. Just enter a competitor domain and Ahrefs will tell you how their website is generating traffic. Magical. Crawler: extract all the URLs from a website. The most popular crawler in the SEO world is probably ScreamingFrog. Topic analysis: analyze titles and clean text from each URL and automatically extract topics. This requires an intelligent tool with advanced NLP capabilities. Frase can help you accomplish this task. Many complex terms are initially only used in academia until they become more mainstream topics. In other words, most people outside academia will know nothing about them. This presents an SEO opportunity because at some point someone will communicate those complex technical topics to a wider audience without the jargon. In general, these topics will initially carry low traffic but high growth and low competition. The search results for academic-oriented topics frequently show results in PDF format, and are usually pay-walled. These two characteristics can be potentially detrimental for SEO purposes as PDF is not the preferred format by search engines. Bounce rates might be higher for paywalled websites. Again, this screams SEO opportunity. I will use Frase to illustrate this strategy. As you might know, at Frase we work on different NLP/AI problems, including automatic summarization, question answering, or named entity recognition. Some of these terms lean towards the academic side. However, business executives are increasingly interested in incorporating AI into their business. Therefore, they might want to read a plain English explanation of what automatic summarization is. As we experienced at Frase, these technical topics might represent an opportunity to educate your audience on new topics. Take a look at the query “automatic summarization use cases”. Frase takes over the featured snippet, in addition to the 1st and 2nd results in page 1 of Google. Some of the most valuable companies were able to create a new product category. When this happens a new term is created, and therefore, a new potential search query. For example, Drift created the term “conversational marketing”. This gives Drift an unfair advantage over all the SEO terms related to conversational marketing. They are probably the only company in the world that has been using the term for years now, so Google sees them as the absolute authority. Just take a look at Google’s page 1. Drift takes 4 out of 10 results, including a featured snippet. I am sure this query brings Drift thousands of qualified leads per month. Coming up with a unique way to define what you do can be strategic for SEO purposes. You will monopolize the early growth of that term in search engines, and reap the benefits in the long run. GrowthHackers runs the largest online community for growth professionals where users share articles on all things SAAS, Growth and Product Marketing. We analyzed 76,970 articles published between 2016 and 2018 on the GrowthHackers community. We then used that data to identify which influencers were mentioned the most during that period. Below you will find an infographic featuring the top 40 most mentioned people (influencers) across the dataset. Enjoy! In case you missed it, check out the top marketing 100 blogs we identified using the same Growthhackers dataset. Why Your Website Needs an AI Question Answering Bot? At Frase, we believe that AI-driven Question Answering is an essential technology capability for future chatbot systems. In this article, we will cover the basics about conversational marketing, the state of AI-driven question answering, and most importantly, why your bot needs additional intelligence to resolve your customer’s questions. Is Your Chatbot Helping Users Learn From Your Website’s Content? According to a recent study by SEMRush, the most influential ranking factors Google looks at are related to user engagement: time on site, bounce rate, and pages per session. If you want your content to be on page 1 of Google, you should invest in ways to maximize engagement. This entails the overall customer experience throughout your website. The question is: when users land in your site through organic search, how do you help them discover and interact with your content? With that question in mind, we recently surveyed 300 people about their behavior regarding site search (the search engine inside your website, if you have one). Survey data showed that most people would rather leave your website and Google again. Outside of e-commerce where site search is critical for product discovery, it seems like most websites haven’t paid much attention to its importance. Site maps: ugly and complicated. Navigation menus: limited in design. Site search: technologically outdated and worse than Google. Chatbots: efficient for marketing, sales, and support, but not great for information retrieval or content discovery. Let’s focus on chatbots. Unless you’ve lived under a rock for the last couple years, you must have witnessed the explosive growth of website chatbots. When you visit a website, the chances are high that there will be an avatar with a welcome message in the bottom right of the screen. To the general public, the term “chatbot” implies automation and the idea of holding a conversation with a machine. The reality is that current solutions are far from that paradigm. How are Chatbots Improving Marketing, Sales, and Customer Support? Real-time response: as researched by Drift, ideally you should respond to new leads within five minutes of them reaching out. Automated scheduling: chatbots allow your website to engage prospects 24/7. Scheduling a meeting is a relatively simple action that can be automated by a chatbot. Lead qualification: chatbots can engage your leads with qualification questions, and integrate customer data with your CRM. Increase landing page conversion rates: chatbots can provide a more engaging and personalized experience compared to traditional forms. Customer support: chatbots can be integrated with your Help Center to provide quick access to support articles. If your customer still needs extra help, chatbots can route you to the right support agent. A chatbot is a computer program designed to simulate a conversation with human users, especially over the Internet (Wikipedia). A Question Answering System is a computer science discipline within the fields of information retrieval and natural language processing (NLP), which is concerned with building systems that automatically answer questions posed by humans in a natural language (Wikipedia). Chatbots are designed to help users complete specific workflows, such as placing an order for a product or signing up for a service. Note that chatbots propose options to the user according to dialogs previously configured by a human (if the user chooses Option A, then reply with Option B, and so forth). Advanced chatbots might let you ask a question freely, but their ultimate goal is to understand your intent and take you down a pre-configured dialog. In contrast, Question Answering systems are not pre-configured. They are trained to learn from a specific knowledge base (like websites or a document repository) and answer questions flexibly, no rules required. Chatbots are usually a blend of human and machine. Most chatbot solutions provide real-time messaging capabilities to allow a regular conversation between humans. For example, you might see a chatbot greet you with some qualification questions, but you eventually start a conversation with a human. In contrast, Question Answering systems are meant to be a fully automated experience, more like a search engine specialized to give you fast access to information. Chatbots attempt to replicate human conversations. To this end, they usually start by asking qualifying questions to keep the conversation under control. In most cases, chatbots don’t benefit from having you ask open-ended questions. In contrast, Question Answering systems work oppositely: they excel at taking questions and retrieving precise information from a knowledge base. Although there is proof that chatbots have a positive impact on marketing, sales, and customer support, some limitations and challenges are affecting current solutions. When a website has a chatbot, it is usually pre-configured to accomplish a particular task. The question is: is the chatbot always aware of what the end user cares about? Or is our chatbot mostly focused on helping you accomplish a business goal? For example, let’s say you run a b2b company selling SEO tools. If someone is reading an excellent blog post you wrote about content marketing, is it relevant for your sales rep to pop up in the screen? Of course, this is something that you can configure in the bot’s settings, but it is always tempting to load the bot everywhere hoping for your readers to engage with your sales team. At the end of the day you are producing content to generate leads, but how do you use your bot without disturbing your readers? As we discussed, chatbots generally rely on particular dialogs and decision trees. In the example below, the user asked “how does SEO work?”, and the bot attempted to schedule a demo instead of addressing the user’s question – not the most useful user experience. When chatbots are automated, they rely on a highly structured knowledge base. Certain chatbots have Question Answering capabilities, especially when it comes down to customer support. Because FAQs are highly structured knowledge bases, it is somewhat “easy” to understand your question and point you to a related support article. The limitation is that this won’t work in situations where your knowledge base is less organized, such as your website, blog or internal documents. Question Answering “in the wild” gets much more complicated. Question Answering has been an active area of academic research for years. With the release of the Squad dataset by Stanford in 2017 (+100k Question-Answer pairs), industry leaders started to build deep learning models that could find answers contained in Wikipedia passages. IBM Watson made headlines with its Jeopardy system, but nobody found production level solutions. Things changed in 2018 when Google released a new dataset and language model called BERT. This model is meant to provide a universal understanding of language. Traditionally, data scientists had been developing task-specific models (for example, your system for topic extraction would be entirely different than your question answering system), but now you could use BERT to generalize across tasks. It only took a few weeks to see developers leverage BERT to accomplish the state-of-the-art results and achieve human performance in the Squad dataset. While progress made on the Squad dataset is excellent, most of the proposed Question Answering systems are not “end-to-end.” They are trained to read a passage and find the correct answer in it. However, there is one big thing missing here: how do you find the right passage when you are searching for thousands or millions of documents? Retrieving the correct passage across a vast repository of documents has become a new challenge. To this end, Microsoft released a new dataset in 2018 called MS Marco. This dataset includes search results to real life queries made on Bing, along with the correct answer buried in those search results – a much harder task. This is all high-level information about the state of artificial intelligence for question answering. Comparisons can be drawn with the progress made years ago when Google released breakthrough datasets for computer vision. The conclusions are: we are making major technology milestones, and fast. What Websites Should Be Leveraging AI-Driven Question Answering? Information-heavy websites, like those including regulations, handbooks, FAQs, and technical content that is regularly accessed. B2B companies producing recurrent thought leadership content in a given industry. Publishers that need to increase page views to increase advertising revenue. Websites that have already embraced website chatbots might be in a good position to provide Question Answering as an additional capability. For example, companies using Drift or Intercom for conversational marketing might have already experienced the power of bots. In addition, help center tools like Zendesk or Help Scout are already offering chat solutions to manage their knowledge base. These are also good candidates to leverage AI-driven question answering. Conclusions: Why is 2019 the Year for Question Answering bots? Conversational marketing and automated Question Answering systems are complementary and fulfill different tasks. Long gone are the days of SmarterChild, and scripted chatbots, technology is coming where you’ll have to think twice, whether or not the person helping you is human. Think about your chatbot strategy as a multi-layered system: from full automation to human conversations. Question Answering remains a significant data science challenge, but we are getting closer to commercialization. Investing in tools that increase your website engagement metrics is vital for organic search growth. Both chatbots and Question Answering can contribute to this goal. Investing in chatbots and Question Answering means making your content future-proofed for conversational search and voice. Marketers are investing billions of dollars in content marketing every year. However, here is a shocking reality: according to Content Marketing Institute, 47% of B2B marketers don’t measure their content ROI. The top reasons cited include “we need an easier way to do this,” and “no formal justification required.” One significant component of measuring content ROI includes tracking traffic to your website — are search engines finding your content? What search queries are bringing the most organic traffic? Are other sites linking to your content? The same Content Marketing Institute report cites “content creation” as the top success factor. How are you aligning your content creation with Search Engine Optimization (SEO)? There is this belief that optimizing articles for SEO will make your content off-brand, boring, and robotic. It seems like many marketers believe that SEO belongs outside of the content creation process. 94% of all blog posts have zero external links. 1.3% of articles generate 75% of all social shares. In this article, I explain the importance of understanding modern SEO, and how incorporating SEO into your creative process can make a difference for your business. Is Your Content Creation Workflow Fragmented? One root problem affecting digital marketing teams is the fact that content creation is a fragmented process. Many companies mostly outsource content creation and have to manage freelance writers. Some companies might not use freelancers, but instead, leverage their in-house experts or guest contributors. And often, SEO agencies are also added to the mix adding yet another stakeholder involved in making search marketing decisions making it extremely difficult to align content creation and SEO at scale. Freelance writers: as companies increasingly outsource their content creation, problems arise as more often than not those writers are not made aware of the company’s SEO strategy. In-house talent and guest contributors: writers outside your marketing team may not understand SEO or even why it’s important when writing content, creating a tremendous missed opportunity. Subject matter experts can be the best candidates to create highly authoritative content. SEO agencies: they help clients ensure their SEO strategy makes sense and provide regular content audits. The problem here is that SEOs typically don’t actually create content, so they are not directly influencing content quality. Content marketing managers: it is not uncommon to find situations where a marketing manager is sitting in between an SEO agency and a pool of writers. With so many stakeholders it can be challenging to understand your role in SEO. More often than not you ignore it. SEO used to be all about keywords and technical optimization. Google was not smart enough to pick up synonyms, understand topic relationships, or respond with featured snippets. Early adopters did very well with internet marketing as they monopolized search results. Keyword stuffing was a widespread practice, and SEOs would drive backlinks from sites they controlled themselves. Search marketing was the Wild West, and SEO practitioners we considered geeks and technical folks. User engagement: according to a recent study by SEMRush, the most influential ranking factors Google looks at are related to user engagement: time on site, bounce rate, and pages per session. The importance of matching your content with user intent is critical. If you want your web visitors to spend time on your content, you have to understand what they are trying to find. Topic quality and long-form thought leadership: Google can draw relationships between topics and understand the depth of your content. When targeting competitive search queries, Google looks at how comprehensive your content is. As reported by Brian Dean at Backlinko, articles with 3,000+ words get the highest amount of backlinks. Many of the tools content writers use today frequently default to SEO lite. These are tools that remind you about things like including your target keyword in your title tag, filling out your metatags, or incorporating a certain amount of internal links. While it’s not wrong to use these types of tools, they do not meet today’s SEO needs. SEO lite tools have become a commodity, and most CMS platforms include features to ensure your technical SEO is in good shape. However, real SEO is all about demonstrating you are a subject matter expert, not about fulfilling a checklist of SEO rules. So SEO comes down to the quality of your research process, which of course takes time and dedication. You can no longer take shortcuts. Since creating authoritative content is an essential factor in modern SEO, how can we insert SEO into the creative writing process? Queries with high volume and high competition: you might find it challenging to rank for certain queries where you compete with big brands. While you might not make it to page 1 in those queries, you should still write about them as they contribute to your overall domain authority. Niche queries with less competition: these are queries that might not carry massive traffic but where you can rank high and bring targeted traffic to your site. Once you’ve decided what search query to write about, you have to understand what your competitors are saying about the topic. Manually reviewing competitors one by one can be very time-consuming. Tools such as Frase that can automatically scan the SERP (the first 20 search results) and give you an overview of the topics they cover make this process easier and faster. Frase leverages machine learning and natural language processing to rank topics. In addition to topics, it is essential to analyze the subheadlines used by your competitors. Skimming through subheadlines is a great way to understand the main points these articles are touching on. Once you’ve understood the main topics and subheadlines, you are ready to come up with your outline. This outline will incorporate ideas from your competitors and your unique perspectives. This approach is known as the Skyscraper technique, where you take what others have done and try to make it a lot better by adding your touch. Now it is time to write! Having a well-structured outline should significantly accelerate your writing process. At this stage, you want to write comprehensive content for each section, and incorporate relevant links to back up your research. Frase helps you stay focused and productive by letting you write and research in the same place. Once you have a first full draft, it is time to collect feedback from your team. Have your manager or editor read your draft and leave comments. You can also use Frase for this process. Once you’ve incorporated feedback, it is time to analyze whether you are missing any critical topics in your article. If you are, you need to find out how your competitors are covering the topic, and if possible, incorporate the topic in your article. Creating SEO content does not mean you need to create robotic, off-brand, or boring content. If most of your content doesn’t get read, it’s likely because your content strategy lacks understanding of user intent. The same person should perform SEO and content writing or be intimately related. Once you publish content, you should refresh your content quarterly to make sure it remains relevant over time. We analyzed 11,833 websites to identify the top 100 most influential blogs covering topics on all things SAAS, Growth and Product Marketing. Blogs were ranked by their engagement (comments + votes) in GrowthHackers, one of the most active communities in the industry. Data collected spanned articles published between 2016 and 2018, for a total of 76,970 articles. This post includes an infographic featuring the top 3 blogs across 10 categories, and the full list with the top 100 blogs. Enjoy! Noteworthy articles on all things product. Strategies and stories on improving user onboarding, retention, and engagement. Get conversion and marketing advice based on scientific research and in-depth industry knowledge. In-depth tips and strategy on improving the performance of your AdWords campaign. The most in-depth and actionable blog about ecommerce marketing, getting more traffic to your online store, and successful ecommerce case studies. Ecommerce tips, strategies, and news. Want to be a productivity ninja? Find more customers for your business? Systemize your business so it runs on auto pilot? HubSpot’s Blog for marketing, sales, agency, and customer success content, which has more than 400,000 subscribers and attracts over 4.5 million monthly visitors. Need fresh advice and actionable insights on landing pages, conversion rate optimization, a/b testing and all things marketing? This is your spot. AdEspresso’s blog is the best resource to stay up to date with Facebook & Google Ads news and tactics for successful campaigns that convert! We provide in-depth articles and training on content marketing; as well as done-for-you content marketing services for growing businesses. Get advice, tools, and services that help your small business grow. Actionable and practical digital marketing, technology, eCommerce and agency tips. eCommerce Marketing Tactics & Digital Agency Insights. Link-Assistant.Com company news, SEO and SMM software updates, user guides and more for SEOs, Internet Marketing agencies and business owners. Ecommerce Blog, Growth Strategies, Multichannel Operations, Retail Trends & Customer Data. Long-form essays on startups, growth, metrics, and network effects. Find more interesting articles which help you in growth your business on lead generation blog. Top Trends, News; Expert Analysis. Articles and tips for improving your company’s customer service, friendly customer support and ecommerce. Interested in startup growth, sales automation, and product design? On our blog the Salesflare team shares inspiring learnings, case studies and stories. Our best tips and guides, expert insights, case studies, and latest news on social media and online marketing. Reply is inbound and outbound sales automation platform that puts your outreach on autopilot while still keeping communication with every prospect personal. Backlinko is the place for next-level SEO training and link building strategies. Perspectives and best practices on product management, building products, user retention, growth, engagement and more. Wistia provides video marketing tips and education along with video production tips. Explore our mobile marketing blog to read our latest reports, case studies, and mobile marketing best practices around mobile messaging &amp; A/B testing. Trigger email, push, SMS, webhooks, and more with Customer.io. Gain control over behaviorial data to personalize customer communication and drive engagement. Tune-in to the Drift blog to learn how to level-up your teams with conversational marketing and sales. The Good’s Insights are in-depth weekly articles, white papers, webinars, and more designed to educate leading marketers on conversion optimization and A/B testing. Comprehensive content about how to authentically grow your product and company. Original and proudly opinionated perspectives on remarkable stories for Generation T.
VentureBeat is the leading source for latest technology news. We give context to help execs, entrepreneurs, &amp; tech enthusiasts make smart decisions. Learn how to take your marketing campaign to the next level with my detailed traffic growth tutorials, unique strategies and digital marketing roadmaps. Lincoln Murphy’s Marketing, Sales, and Customer Success Thought Leadership. We cover case studies, the best of Silicon Valley growth strategies and tactics for user acquisition, monetization and retention. Discover the most comprehensive digital marketing repository on the web. Start learning how to get traffic, acquire leads and generate sales today. Design and AB test App Store and Google Play Icons, Screenshots, Videos and descriptions to optimize your app store install conversion rates and build the perfect ASO strategy. Get all your SaaS & Subscription Metrics with a Single Click! MRR, churn, LTV and much more. Looking for a good e-commerce blog? Sleeknote is a marketing blog that focuses on actionable e-commerce tips, strategies, case studies, and more. Learn how Inbound Marketing can help you get more traffic from the customer you want. With our WordPress plugin we let you you focus on the writing, while we turn them into leads, because more qualified leads means more profit. The Ladder Growth Marketing Blog shares the latest marketing tactics & strategies, proven to increase ROI for businesses across every channel. Chamaileon’s email marketing blog focuses on email design & copywriting. You can find articles & resources in connection with the latest email design best practices, trends & template inspirations. WordStream’s award-winning blog features new content daily to help you master online marketing and advertising, including breaking news, original data, and friendly expert advice to help you grow your business. Hacking Revenue is a magazine about building and monetizing online products. The Wishpond Blog creates comprehensive, actionable strategy guides to help drive business growth. We focus on social media, sales funnel optimization, email marketing and marketing automation. The Wall Street Journal calls Neil Patel a top influencer on the web, Forbes says he is one of the top 10 marketers, and Entrepreneur Magazine says he created one of the 100 most brilliant companies. Viral Marketing, Growth & Startups Blog. Get the best content for creating better products. Powerful APIs designed to help your business grow. Never go over budget again with these must-have practices, tools, and tips. This is your proven guide to project budgets: create, manage, and deliver. Monitor the media, your brands and competition in real-time, on all-devices, for free! Be in the know, on the go! Conversioner is a leading conversion optimization agency that specializes in emotional targeting. Discover everything you need to know about SaaS Marketing & Growth Hacking. Grow your Business quickly & cost-effectively. SEMrush’ digital marketing blog is an innovative resource for content strategy, content marketing, SEO, SEM, PPC, social media and more. 500’s mission is to discover and back the world’s most talented entrepreneurs, help them create successful companies at scale, and build thriving global ecosystems. A blog about marketing, starting businesses, self-exploration, and tacos. Growth Everywhere is a blog on business and personal growth. Find b2b data, emails and phone numbers of businesses using AeroLeads. We help you get better at SEO and marketing: detailed tutorials, case studies and opinion pieces from marketing practitioners and industry experts alike. Learn about Net Promoter Score (NPS), Customer Success and how to grow your business revenue by improving customer retention and decreasing churn. Our technology helps the world’s biggest brands listen to their customers and understand consumer trends. Stay up-to-date on Heavybit news and developer-focused content. Search Engine Watch provides tips and information about searching the web, analysis of the search engine industry and help to site owners trying to improve their ability to be found in search engines. Stay up-to-date by reading our seo and content marketing related articles. Find new ideas and classic advice on strategy, innovation and leadership, for global leaders from the world’s best business and management experts. Segment’s Customer Data Infrastructure (CDI) is the technical foundation for customer-first businesses and provides data integration (Connections), data governance (Protocols), audience management (Personas). Inside Intercom, the customer messaging platform that helps grow businesses faster through better relationships. Pagewiz Landing Pages for online marketeers – Create, Optimize, and Publish your landing pages. Automizy Email Marketing Blog: You can find articles about the latest email marketing automation trends, lead generation, and management. The latest in referral marketing strategies and programs. Learn about Net Promoter Score, customer loyalty and how to reduce churn and drive growth for your business! Go to guide to digital marketing, SEO, Influencer Marketing, Product Launch and many more. This is Hiten’s blog. He is an entrepreneur who has started two SaaS companies. Content optimization is a daunting topic. In December 2018, over 136 million new blog posts were published on WordPress alone (source). With so much content out there, is it still worth taking the time to optimize your content? Add to that the challenges of keeping your existing content relevant: how do you decide between updating old pages and writing new articles? And then there’s Google. Keeping the behemoth happy involves knowing which ranking factors and user signals matter. But are content marketers expected to be SEO gurus? The truth is at the heart of every effective content marketing strategy lies a systematic approach to content optimization. And with 2019 set to be the most competitive year yet for content marketers, it is a must-have for successful content campaigns. This guide to content optimization will help you overcome all these initial challenges and find a logical starting point. From there, we offer a 7-step strategy for optimizing any piece of content with no prior SEO knowledge required. But before we talk strategy, let’s clear up a few things. Content optimization can be defined as making online content as interesting to both users and search engines like Google as possible. For users, content optimization means consistently providing excellent quality content that perfectly matches their search intent. If they ask a question, then your article or page should provide the best available answer. For search engines, content optimization involves using SEO (search engine optimization) and other techniques to make your content machine-readable, discoverable, and well-structured. Why Do I Need a Content Optimization Strategy? Few would argue that content marketing forms the bedrock of most successful digital marketing strategies. In fact, a recent report found that 93% of successful B2B marketers remain very or extremely committed to content marketing in 2019. Yet the same report found that only 39% of B2B digital marketers actually have a documented content marketing strategy. This means the door is wide open for strategic content marketers to prosper with optimized content. The bottom line is that anyone regularly publishing content needs a solid content optimization strategy to stay ahead of the content curve in 2019. If you don’t have one, then make it your new year’s resolution. 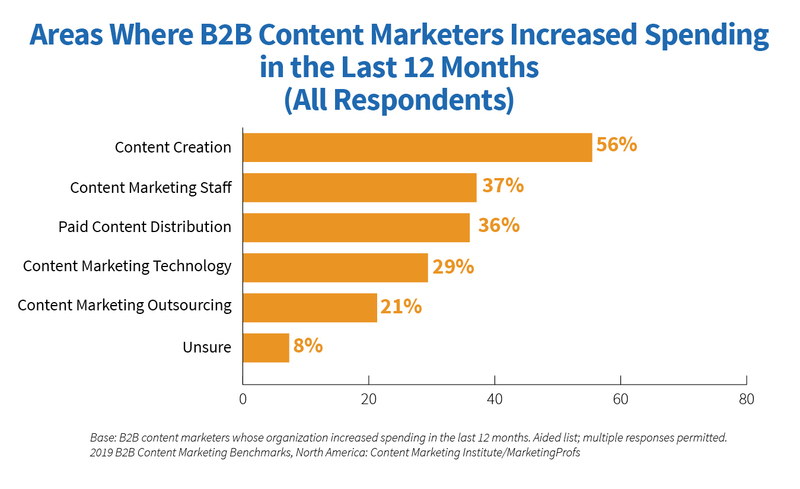 Research by Content Marketing Institute in 2018 shows how B2B content marketers are investing heavily in content creation. What Are the Benefits of Content Optimization? SEO: Well-optimized content has been proven to boost search engine rankings. Traffic: Higher rankings mean more organic traffic. Trust: Optimized content increases topic authority and trust, both with your users and Google. Efficiency: Updating and republishing existing content can save a lot of time. Future-proof content: Regularly optimizing your content inline with best practices allows you to stay relevant. What Are the Types of Content Optimization That Matter? Some common SEO techniques for content optimization include strategically placing internal (inbound) and external (outbound) links; optimizing metadata and HTML tags; and backlink building. These techniques affect where your page appears in the search engine results pages (SERPs) and how these results appear. They do not usually affect the quality of the content for the user. We take a closer look at the most important SEO content optimization factors in the guide below. Non-technical content optimization encompasses the overall quality of the content. This can include readability, article length, topic coverage, and use of images and videos. Each piece of content can be rated on a quality scale. Ultimately, users decide which piece of content best meets their needs. Note: Some factors blur the boundaries. Article length and topic coverage are signals to search engines that your content is of high quality. However, content should always be created with the user in mind. Increasing word counts or topics mentioned just to boost rankings will result in bad user signals and drops in the ranking. Technical content optimization gets your content in front of readers. It ensures your content appears in search engine results pages. Non-technical content optimization i.e. the quality of the content is correlated to how your content performs over time. In general, the higher the content quality, the better it performs. A combination of both approaches is needed to optimize your content to maximum effect. The guide below will show you one approach to do this. How Does Google Generate Organic Search Engine Results Pages (SERPS)? Google is getting smarter all the time. Its main goal is to understand all types of search engine queries and provide the most relevant results to users. Google Search’s ability to differentiate between search queries is called semantic search. This is reflected in the Hummingbird and RankBrain updates. Both updates saw artificial intelligence (AI) and natural language processing (NLP) techniques applied to search engine results in order to understand user intent. Google matches these queries based on the predicted desire of the user – user intent – to what it considers the most relevant results. Most content optimization efforts target informational queries. But how does Google decide which results are the most relevant? Content Relevance: Who Has the Final Say? So who actually judges whether content is relevant or not? Google or your users? Both. If your site has a high domain authority, then Google is most likely going to rank your content above a site with lower domain authority. But it’s not quite that simple. Google is looking for authoritative content. For example, if someone queries “best content marketing strategies for WordPress,” Google will parse sites looking for related content such as general content strategies. If a site has a lot of authoritative content on closely related topics, then Google is more likely to feature an article that matches that specific query in the search results. This means keyword optimization has become topic optimization. Search engines like Google now think in topic clusters. Backlinko did a study to measure the importance of topic coverage. In it, they used MarketMuse to examine 1 million Google results and the correlation of their topical authority (i.e. thoroughness and depth of expertise) and rankings. However, what determines rankings over time is how users react to your content: do they stay on your page (time on page)? How often is your result being clicked (click-through rate)? Does it satisfy their query? Is it being shared on social media? This is why content needs to be primarily human-readable and always serve user intent. The search engine rankings will come over time. Since the HummingBird and RankBrain updates Google thinks in topic clustersand connected information. Google is getting smarter all the time. AI and NLP allow Google to understand context and semantic meaning. Google now scans your whole website and is looking for authoritative content to assess the relevance of one article. To maximize relevance, content should be thought of in terms of topic clusters. Mobile-friendly: If you only have a desktop version of a site make sure it is mobile friendly. A recent Google update has started checking whether your site is mobile-friendly as a ranking factor. Mobile-first index: Google has begun rolling out a mobile-first index. This initially only targeted at users with mobile devices and affects mobile search engine results pages. The primary reason for wanting to increase web traffic is to increase sales. But forcing users down a funnel of landing pages to try and make them convert is not going to go well in 2019. Users are more skeptical of sketchy content than ever before. Bounce rates are sky high. Tell users what they need to know and keep them on your site while educating about them about your product. So, the challenge as a content marketer in 2019 is this: Write human content that keeps the SEO team happy. The number one goal of every content marketer should be to create content provides a great user experience. Technical ranking factors should only be a secondary consideration. This seven-step approach to content optimization works for new and existing content of any kind. It’s aimed at content creators that want to produce high-quality content. You don’t need any SEO experience. Ready to revamp your content marketing efforts? This may seem an odd place to start. But before you do any research or writing, you need to map out the structure of your content. Let’s take an example. Say we want to create a content campaign around the topic social selling. Content is always connected to other content. We need to define pillar pages and cluster pages to optimally link between related content. A pillar page covers the main topic (short tail keywords). A cluster page goes into detail about each related subtopic (long tail keywords). Back to the example. Is social selling a pillar or a cluster page? The answer is it depends. If you own a website specializing in selling for social media, then this is an overarching theme. However, if your site sells in general, then it would be a subcategory or cluster page. A good pillar page should be a fundamental topic that is also closely linked to one of the core areas of your business. Cluster pages are pages that cover subtopics related to your pillar page. These are in-depth articles. One technique to find perfect cluster pages is to open a new Frase document and query your pillar page. Frase’s research assistant will automatically show you what topics are mentioned by top-ranking competitors with the same pillar page. The resulting topics are ordered by relevance and are a great starting point to find your cluster pages. Select topics that are high up the list and also closely related to your business or product. Cluster topics: Social Selling for LinkedIn, Social Selling Techniques, Sales Navigator, LinkedIn Profile. The beauty of this technique is Frase pulls in what is relevant today. 3) Competitor Analysis: How High Is the Bar? Now you have a structure for your content cluster, it’s time to check out the competition. Who is currently top of the rankings? Why are those particular results at the top of the rankings? How do they address their user?. How readable are the articles? How do users navigate around the site? As well as checking relevant topics, the Frase research assistant can also give you the average word length of top results and links to the best articles with automated summaries– all in one place. You should aim to produce content that is better than your top competitors. To republish or not to republish, that is the question. What’s great about already having a content cluster is that you can see at a glance whether or not you have content you can re-use before content creation. If you already have an article that is performing well and that fits into your topic cluster, it’s a perfect candidate for republishing. So now you know what topics you need to update and what you need to write from scratch. Start with your existing content. The goal is to find “gaps” and fill them with meaningful, authoritative content. A gap is a topic that top results have included in a similar page, but you have not. Doing this manually is pretty tedious. Just like Google works with NLP to make sense of text, so does Frase: This handy guide shows you how to optimize content with Frase. What makes this technique so powerful is that it also works with creating new content. Frase automatically checks top competitors based on your title so you don’t miss any important topics. This drastically increases the chances that your content you produce will be more comprehensive and thus categorized as more relevant by search engines. Once you’ve created your pillar and cluster pages, it’s time to edit. Why? By imitating the words, phrases and questions of your users you can increases user engagement. It makes your content more compelling if it solves genuine problems. Where do your users and potential customers hang out? Quora, Twitter, Facebook groups, Slack channels, webinars are all good places to find your audience. When a topic comes up, take notes on how your users talk about this topic. You can even include these questions in your articles. Using concise sentences and short paragraphs aids readability. Readers skim online content, so make it as easy as possible to quickly understand the structure of your content. Google cannot necessarily read how relevant images and videos are to readers; relevance is judged primarily on text relevance. However, images and videos undoubtedly make content more engaging. This can increase user metrics and social signals (time on site, or social shares) which can, in turn, be beneficial to your SEO efforts: it’s a win-win. The following is a non-exhaustive list of some of the most common technical factors that should be considered when publishing online content. Internal and External Links: Start with your internal links. Make sure your cluster and pillar pages are linked where appropriate. External links should be used to help your reader access information that is not on your site. This includes checking a data source, a blog article published elsewhere, and downloadable data. Make the link textas descriptive as possible so the user knows what to expect when they click. Finally, ensure that all links are working, as broken links (404 errors) send negative signals to both users and search engines. Meta tags are snippets of HTML code that provide information about the properties of webpage, including the title and description of the page. They are located in between the <head></head> tags of your website. Title tags (sometimes called meta title): Use the title tags to define the title search engine result pages and can differ from your article title. It should be as descriptive as possible as it plays a large role in whether users click on that result. Meta descriptions: Meta descriptions, like title tags should be unique and descriptive. If Google parses your site and finds two meta descriptions are exactly the same, it can be an indication of duplicate content which can harm rankings. Meta descriptions should also include a call to action (“learn more”) if appropriate to encourage users to click. Image tags (helps Google and accessibility readers): Add a descriptive alt tag to your images. Most CMS platforms including WordPress offer this option when you upload an image. Structured markup/Structured Data: For certain types of content, Google has developed a special set of tags called structured data. These tags help Googleunderstand your content. They are used to display rich results including article carousels, rich snippets, featured snippets, carousels, and answer boxes. Open Graph: Open Graph enables your content to be recognized and shared across social media platforms like Facebook. Adding Open Graph tags means that when a user shares your content on social media, the result is turned into a rich objectand optimized for each platform. Open Graph markup includes information such as which title and image to display. Twitter has its own set of Open Graph markup which enables Twitter cards. Latent Semantic Indexing (LSI) keywords: LSI keywords are keywords related to your topic. Put simply they are different ways of saying the. same things (black Nike shoes vs. Nike shoes black). Keyword density: Keyword density is simply how common your target keywordappears in your text. In general, a better approach is to check your topic coveragerather than fixate on keyword density. As Google continues to make strides in AI and NLP, satisfying user intent will continue to be the most important factor in determining search engine rankings. The more Google is able to understand, the better the results will be. For content marketers this means disposing of traditional SEO approaches to content and thinking in terms of topic clusters and ordering information in a way that best meets the needs of their users. Frase – AI tool for automating research and analyzing topics etc. Twitter cards docs – check out how to mark up your articles to be shared on Twitter. Open Graph – more info on Open Graph. Structured Data Testing Tool – check you have the right tags for search engines like Google to return featured snippets and rich search results. Google AMP – more info on the Google AMP project. Google Mobile-Friendly Test – check if your site is mobile-friendly and supports users on mobile devices.